APARTMENTS & TOWNHOUSES WHERE GOLF AND SEA MEET in the heart of the Costa Del Sol! Welcome to these apartments & townhouses, a new Mediterranean style complex with a stunning natural frontline golf surrounding, ready to move into. Located in the sought-after area of La Resina Golf & Country Club in Estepona, a desirable location of luxury villas and amazing sea view properties, at only 1.3 km to the beach. The vibrant city of Estepona is located at a mere 5 minutes away, as well as the international Marbella and Puerto Banús, with its cosmopolitan atmosphere. An array of International Golf Courses and local amenities are located at a 4 minutes quick drive, as well as shopping areas, beach clubs and fine dining restaurants. 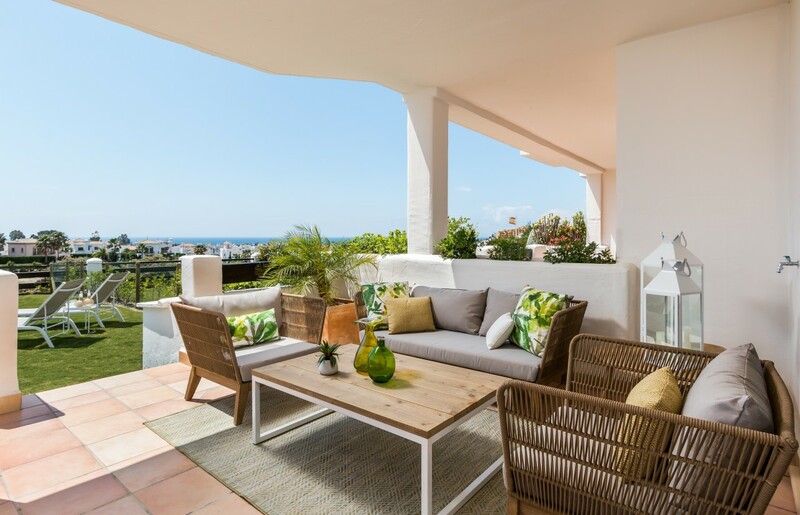 The complex benefits from a privileged top-of-the-hill location, with a convenient south to south-west facing orientation, to enjoy the privileged Spanish weather and the stunning sea & golf views from nearly every apartment. The impressive development enjoys a large communal swimming pool, with dressing area, lush tropical gardens that are criss-crossed by charming pathways, and 24 h security including video surveillance. Inside, the apartments benefit from fully fitted kitchens with Siemens & Bosch appliances, fitted wardrobes, air conditioning, fitted bathrooms, double glazing, reinforced security door, porcelain tiles in floors, entry phone, safe in the master bedroom and large terraces. In addition, the penthouses and townhouses offer Jacuzzi on the terrace, to relax in while enjoying the fantastic sea views! A storage and secure underground parking space is included in every apartment.